Each Acqua di Parma Cube Candle is carefully hand crafted in Italy using the highest quality natural waxes, fragrances and cotton wicks to ensure a clean burn. A master craftsman is responsible for the creation of the candle from start to finish, a process which requires 24 hours to complete. These luxurious, hand crafted masterpieces are ideal for relaxing at home or while entertaining guests. Now reformulated, complete with new packaging designed to protect the candle exterior. Dual chamber construction ensures the Acqua di Parma logo remains intact during use. 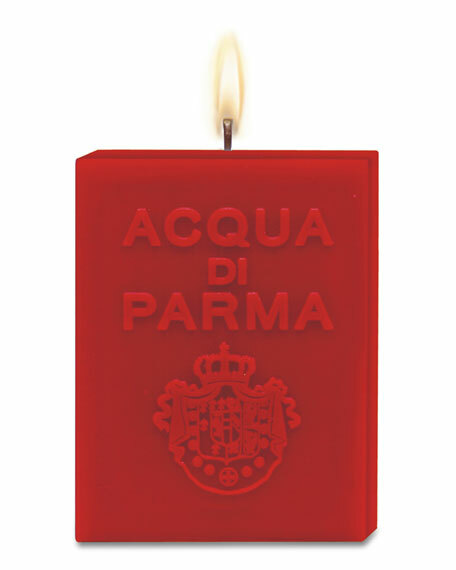 Acqua di Parma Cube Candles have an approximate burn time of 60 hours.